The Clek Fllo is the compact convertible car seat from Clek. It is lighter and somewhat smaller than the Clek Foonf, it's larger more expensive brother. This seat uses quality materials and is designed with supportive dense foam for comfort with an adjustable headrest conducive to napping. We like the anti-rebound bar for the rear-facing installation and the belt lock-offs that are easy enough to use. Unfortunately, this seat is heavy and cumbersome which makes installation a little more difficult. It also has a cover you can't remove which could be a problem if your child has an accident. Overall, the Fllo is an okay seat and come in with an average overall score, but the trouble we had with installation makes use prefer the Foonf over the Fllo. However, if you need a narrow seat, want something smaller than the Foonf and don't mind taking more time with installation, then the Fllo might be one to watch. Clek is a North American company that is headquartered in Canada. The company strives to think outside the box to create and produce innovative designs that are safer and stylish. Currently, they only offer safety seats and accessories. The majority of their seats include a steel frame design that mimics the design of your vehicle seat. The Clek fllo is a high-quality seat with a price to match. Unfortunately, it is harder to use and install than the Clek Foonf, which makes it our second choice in the Clek family of convertible seats. The Clek Fllo (in blue) did not perform as well as the Clek Foonf which resulted in it earning a lower overall rank. The test performance of the Fllo is detailed below. The Anti-rebound bar used in the rear-facing configuration helps prevent extra movement in the seat during a crash which should translate to little ones moving less as well. The Fllo earned a just above average score for crash test results with a 7 of 10. While not significantly better than the competition, it is better than the average score for the group. Each seat for sale in the US must meet or exceed Federal guidelines outlined in FMVSS 213. Therefore, all of the car seats in this review are considered safe and the Fllo is somewhat better than some of the competition as indicated by its recorded results. 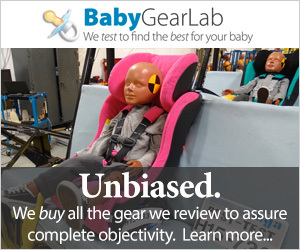 BabyGearLab tests each seat using the same methods and facility that the National Highway Traffic Safety Administration (NHTSA) uses so we can compare results side-by-side. The comparison graphs below include the test data for the head sensor (HIC) and the chest sensor (g clip) from the Fllo compared to the best results from the group. The Essentials by Britax Allegiance has the best HIC results with a 186 compared to the fllo's 320, where lower is better. The fllo did no perform as well as the Foonf in our crash tests for the chest clip earning a 40 compared to 33 where lower is better. The results include the HIC results for the Britax Allegiance and the Clek Foonf for the chest clip which both earned the best results. The Fllo comes standard with an anti-rebound bar (ARB) which is considered an additional safety feature. This feature works in the rear-facing configuration and helps stabilize the car seat against the vehicle seat back to help reduce the rotation or recoil of the car seat in the event of a collision. The fllo is not the hardest to install using LATCH, but it isn't the easiest either with a score of 7 of 10. This method should theoretically be easier to use than using the vehicle seatbelt. The fllo LATCH connectors are the easier to use button style that clicks in place and removes with a press of the red button. The Fllo has the button style LATCH connectors that are easier to remove and connect than the clip style connectors. Both are considered safe, but those with the release button are easier to use. Attaching the bar to the seat is time-consuming and takes more work than we think it should. The Fllo has a level indicator (above left) designed to help parents find the correct installation angle for installation. It also has a recline angle adjustment on the bottom of the seat (above right) that can help achieve this proper angle. The sheer bulk and weight of this seat make it challenging to deal with and maneuver inside the vehicle. Some testers had difficulties fitting their hands through the holes to thread the LATCH connectors and vehicle belt. Everything about this seat, in general, is harder than the competition. Installing the Fllo with the vehicle belt is about the same difficulty wise earning the same score as the LATCH method with a 7 of 10. Once again the size and weight make it harder to maneuver and belt pathway and lock-offs are a little cumbersome compared to the competition. The rear-facing configuration threads the seatbelt through the seat bottom of the Fllo (above left). It requires lifting the seat bottom and using the locks under the seat (above right). The process has more steps than the competition but lock-off is easy enough to use. You can use this method with both a lap only and a lap/shoulder belt. The forward facing configuration is somewhat simpler because you don't need to lift the seat bottom to thread the seatbelt (above left) and it has side lock-offs that are easy to use (above right). You just need to make sure you use the right lock off based on the directions and location of the seat. The rear-facing installation with the seat belt is extremely difficult. It was stable once we managed to get it installed but some users had trouble closing the belt lock-off without help. The fllo ARB connects to the seat bottom with a hole and pin system that is harder to use than it looks. The Fllo is one of the harder seats to use along with its brother the Clek Foonf earning a 5 of 10 for both. The size and weight of this seat make it more difficult to maneuver in the backseat which contributes to making it harder to use. The buckle and chest clip on the fllo are stiff and rethreading the shoulder straps for height adjustment is more convoluted than the simple non-rethread design we prefer. The harness is a rethread style that requires removing straps from a hook and threading through new slots and replacing on the hook. It isn't hard to use, but it isn't as simple or quick as the non-rethread options. Don't be fooled by the movable headrest, it is not the same as the harness assemblies that move with their headrests. The shoulder straps have 6 height positions and the crotch strap has two. Tightening and loosening the harness is simple and smooth. The buckle and chest clip are both stiff, but manageable. The LATCH connectors store under the seat bottom and the manual slides into a pocket on the back. The manual is out of the way of little ones and accidental spills, but if you move the seat you'll want to make sure it stays put. You can remove the cover on fllo but you aren't supposed to and it could be hard to put it back on. The cover is not removable which means it is spot clean only. This could be an issue if little ones have an accident or spill their drinks. The company claims the cloth is easy to keep clean and they offer a cleaning kit sold separately. The fllo earned impress test results for comfort and quality with an 8 of 10 and dense foam for support not found on the majority of the competition. The Fllo is one of the higher quality options with several features for comfort making it a top scorer with an 8 of 10 in this metric. This seat has dense thick padding over the entire seating area. It is very firm but still feels comfortable giving support where other seats lack it. The fabric fits the seat well and because it isn't removable it looks like upholstery instead of a slipcover. The material is soft and somewhat towel like with a spill-resistant coating the company claims is easy to keep clean. The shell and bottom are contained and relatively smooth. It is designed to keep things contained and it does a good job. The Fllo weighs more in the rear-facing configuration thanks tot he addition of the ARB. You don't want to skip this safety feature for a lower weight. Thanks to the steel internal framework, this seat is one of the heavier options earning a 6 of 10 for weight and size. Rear-facing this seat weight 28.8 lbs and forward facing it is 25.8. This is almost 10 lbs lighter than its bigger brother the Clek Foonf but it is still hefty compared to the competition with only four options weighing more. On the plus side, it is only 17 inches wide making it one of the narrowest options in the review and theoretically allowing for three seats across most back seats. Amazon $322.99 - 15% off!